After many many years of making custom PCs and laptops, Alienware has decided to descend into the high-end gaming peripherals market with their AW958 Elite Gaming Mouse and the recently reviewed Alienware AW768 Elite Gaming Keyboard. 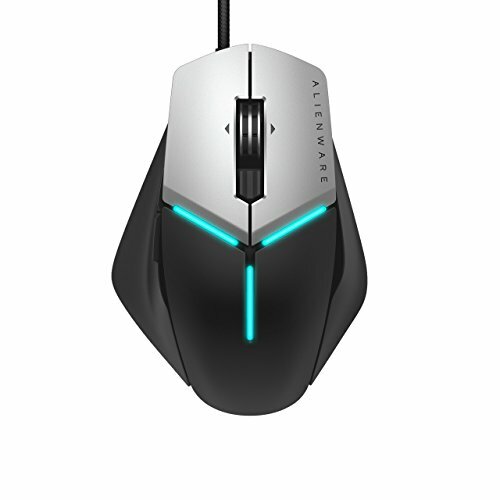 The Alienware mouse is pretty standard in terms of design and has a few choices which are a little strange. Worst of all is the price, it is hard to imagine how the mouse was as expensive to make as the selling price of £89.99. It seems like it will come with some of the newer systems but it’s a hard one to recommend due to the comfort and cost. 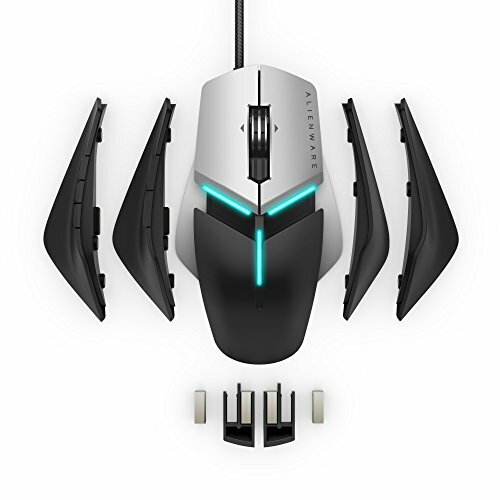 The main pull of the Alienware mouse is being able to change the sides which allow you to make it wider and provide more support for your hand and fingers. With the default sides is measures 13cm x 9.5cm x 4cm. You can swap out both sides but only the right-hand side of the mouse provides more width. The side where your thumb would rest just allows you to either add some additional buttons or have nothing there at all. Trying out both different sides, either option was not all that comfortable. The bigger side that sits on the right goes too far out and makes the mouse feel uneven, while the smaller option still felt a little off. The style of the mouse is fairly basic, it has a tidy design with silver buttons and the rest being in a black matte colour. It looks like a more styled office mouse rather than your more traditional gaming mouse. It still has some lighting on the body in three lines though but not something you’d really see once you have your hand over the top. There are thirteen buttons altogether, with the left/right buttons, a scroll wheel that clicks and the side which comes in two or six button and top DPI switchers. There’s a lot of options for tweaking with the AW958, you can add weights to the mouse, adjust the height of the palm rest and with the side parts it’s quite an array of options. Even with all the options though it was not all that pleasant to use for long periods of time. The A768 runs on the same software as the keyboard, which makes sense seen as they are bundled together with the Alienware kit. This allows you to record your macros, but rather than select a series of options from the UI, you need to manually record them with the actual clicks. It would make sense for it to be more of a drag and drop design that is clicking away with your mouse. It’s not a major issue obviously but Alienware should have seen what other companies were up to in their software and followed suit. The swappable sides do set it apart from some of the other mice on the market but the options seem a little discounted from the main product. Sure it is nice to be able to add more support if you are a palm grip gamer but how big do your hands need to be for the side Alienware have included, a giant? The included weights, parts and options are a bonus but don’t particularly make the mouse any better for it. Most gaming devices perform pretty well, the Alienware AW958 Elite Gaming mouse is no different. Testing the mouse in Overwatch, Fallout 4 and Battlefield 4 it handles everything well with no real issues. Playing as Hanzo, the mouse was accurate and kept up with my flick shots with his bow. While playing Sniper on Battlefield, the DPI switcher was handy to swap speeds to get those slow considered headshots. Finally, with Fallout 4 being a more general all-rounder, it was fine for movement and combat being able to not rely heavily on the V.A.T.S system. I did try to use the six button layout for Fallout 4 as it made sense to set up some buttons for tasks and weapons. In theory, it seemed like a good idea but the buttons are quite closely tied together which meant hitting one button usually meant hitting another at the same time. If you used it enough, like the Razer Naga you would probably get used to it but they could have spaced them out just a tad more. Should I buy the Alienware AW958 Elite Gaming Mouse? The AW958 is a good first try from Alienware but they need to go back to the R&D stage and take back feedback from gamers and critics for their next iteration. The swappable sides are a good idea but in practice don’t really work. Overall the mouse is not that comfortable and something which is quite crucial for long gaming sessions. The big cross though is the price, for £90 it is far too expensive, being able to get much better mice for less, such as the Razer Naga Hex V2 for £75 or the SteelSeries Rival 500 for £79.99. If the AW958 comes packaged with your system, it’s worth keeping as in games it holds up well for everyday gaming and it’s got a non-offensive design which would go with your new PC set up. If you are looking for a new mouse though, I’d have to say give it a miss and buy a better mouse that is out there for less money. If it was £30-40 cheaper then it might be a worthwhile entry gaming mouse. If you got the Alienware mouse with something then AW958 is worth keeping but for £90 it is not worth spending your money on.